About a century ago, Sir George Darwin (son of Charles Darwin) put forward the idea that the Moon is moving further away from the Earth. To test this theory, the Apollo 12 astronauts placed a set of reflectors on the Moon to measure the Moon's distance from Earth accurately. 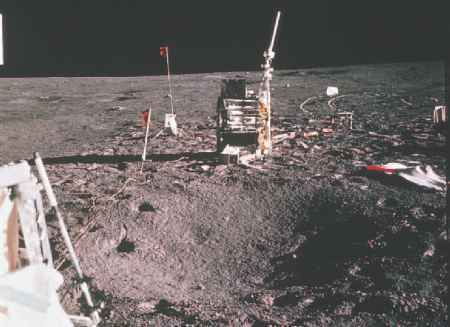 Pulses of strong laser light were fired at the Moon from Earth, and the time taken for the light to bounce off the reflectors and return to Earth was measured. Knowing the speed of light and the time for the pulses to return enabled astronomers to calculate the distance to an accuracy of less than a metre. From such measurements over time, astronomers have found that the Moon is spiralling away from the Earth at a rate of about 4 cm per year. The cause of this motion is thought to be tidal interactions between the Moon and Earth. Tidal forces are also causing the Earth's rotation to slow by about 1.5 milliseconds per century. opposite side of the Earth. Low tides occur where the Moon is on the horizon. The Sun also distorts the shape of the oceans, but only half as much as the Moon, because the Sun is nearly 400 times further away. The Moon has a smaller mass, diameter and average density than Earth. Because of this, the strength of gravity on the Moon's surface is one-sixth that of Earth. A 75 kg person on Earth weighs 735 N, but on the Moon the same person would weigh only 122 N. The Moon's escape velocity is only 2.4 km/s. Scientists have found out what the interior of the Moon is like from seismic (moonquake) evidence made at the Apollo landing sites. The Moon has a crust, mantle and core. Although these regions are similar to those of the Earth, the proportions are different. The Moon's crust averages 68 kilometres thick and the thickness varies from a few kilometres under Mare Crisium on the visible side, to 107 kilometres near the crater Korolev on the far side. The crust is thicker on the far side than on the side that faces Earth. This means the Moon is slightly egg-shaped, with the small end pointing towards Earth. 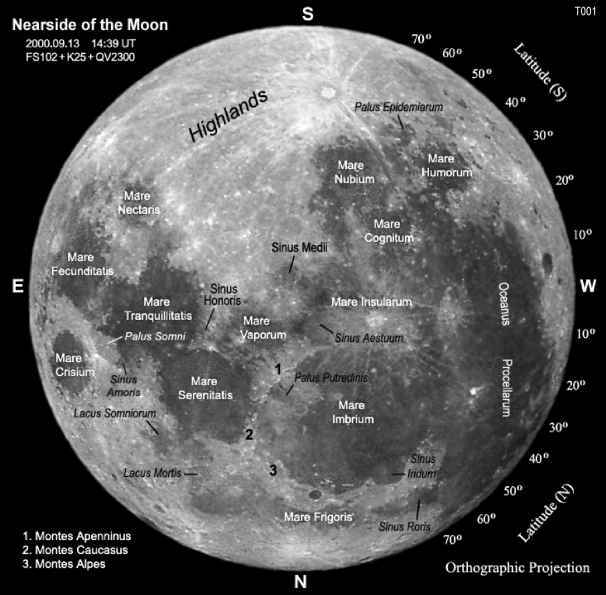 As a result, the Moon's centre of mass is 2 kilometres closer to Earth than its geometric centre. The difference in thickness also helps explain why most of the mare basalt lavas are confined to the near side of the Moon. On the near side of the Moon the lavas would have reached the surface more easily. Seismometers placed on the Moon by the Apollo astronauts found moonquakes occur on the Moon on a fairly regular cycle of about two weeks. They apparently result from the tidal stresses induced in the Moon as it rotates about Earth. Most moonquakes measure less than 3 on the Richter scale.